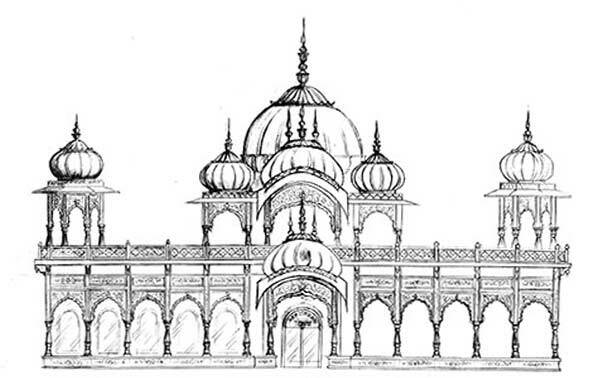 This year all donations received less festival expenses will go towards the final touches on the construction of the Radha Govinda Temple in Salt Lake City. Thanks to everyone for extra special generosity. The Krishna Temples have planned transcendental celebrations for the Appearance Day of Shree Krishna. From 7 pm til midnight Sat. Aug. 24 in SLC and 5 pm - 8 pm in Spanish Fork on Sunday August 25. 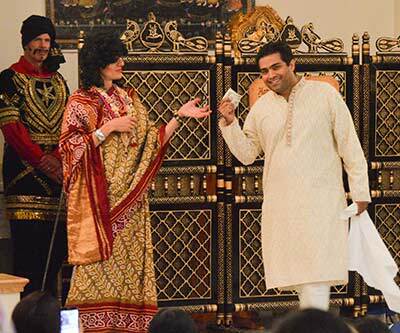 There will be Indian dance, drama, musical concerts, hot meals, exhibits, and gifts available to all. This holiday for Hindus compares to Christmas Day. 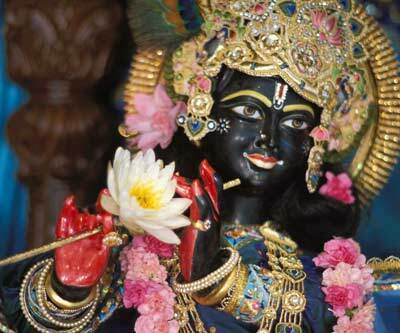 Five thousand years ago Shree Krishna appeared on earth to protect the pious, annihilate the miscreants, and reestablish the principles of virtue. This was accomplished in a span of 125 years even at the end of which the Lord appeared as a fresh blooming youth of 16 or 20 years. Before returning to His own spiritual abode, the Lord spoke the Bhagavad Gita (Song of God) to his friend and disciple, Arjuna, thus leaving behind Him a legacy of wisdom for the ages. Devotees chant His Holy Names considering that the names of the Absolute are non-different from the Absolute Himself. Aside from the ubiquitous chanting there will be many other elements to celebrate His advent during the celebration of his earthly appearance. 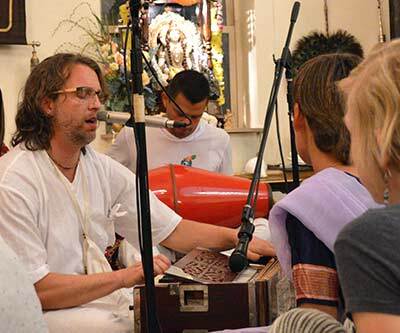 In Spanish Fork the kirtan will be part of Rathayatra, Chariot Festival round temple verandah. 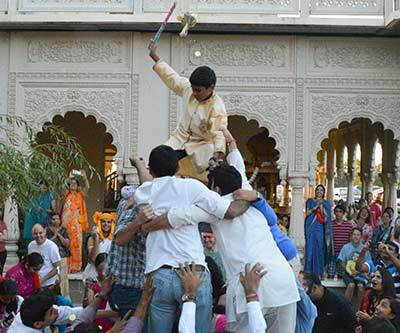 As Krishna did when a child, participants will climb on each other’s shoulders to reach and break a high suspended pot full of butter and yogurt. Story of Ajamile. Actors, Droupadi Rani & Shyam Vihari, Pakhi Misra, Sahsi Rathan, Ras Vilas, Divyam, Nimai Prabhu and Sri Maha Prabhu. Featured Dance Program by Divya Narayan Dance School from Salt Lake City, Utah. The dance form is over 2000 years old and is the classical dance from the state of Tamil Nadu. It is one of the most popular Indian classical dance forms recognized internationally. Bharathanatyam is a vibrant dance form that combines rhythmic footwork with intricate hand gestures and subtle movements of the whole body parts. The dance has crisp geometrical movements; sculpture – like poses and fast and rhythmic footwork and delicate facial expression. Typically, several years of training are required for the dancer to perfect the combination of these elements that characterize Bharathanatyam. There are two versions to the literal meaning of the word Bharathanatyam. One version is that it is the dance (natyam) written by the sage Bharata. And the other version is that its the combination of Bha – for Bhava (the expressions), Ra – for Raga (the melody) Ta – for Tala (the rhythm) and Natyam – for Natya (the dance). Sponsors will assist the priest in bathing the Deity, and take home the kalashas along with other gifts. 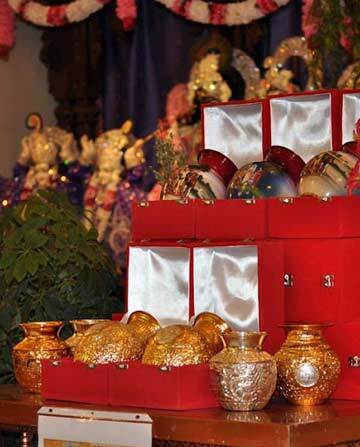 Pictured here are the Golden Kalasha (US $ 301.00) and the Deluxe Kalasha (US $ 501.00) which the members will receive after the gala Janmastami celebrations and abhishekam (bathing ceremony). Our grateful thanks to each and every one of the donors. 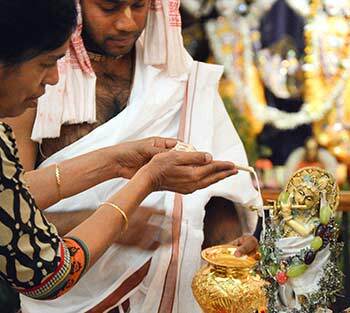 The kalasha abhishekam (bathing ceremony) will take place about 10:30 pm. We’d like to thank the many families who participated last year, and all those who have been regularly supportive over the years. This year we were hoping for new members, or heretofore marginally supportive ones, to step up and help us double the number of kalasha sponsors. In expectation, we ordered 100 kalashas from Vrndavan, India. For anyone who cannot be present to personally bathe the deities, we shall do the bathing in your name and send the kalasha and other gifts by post. 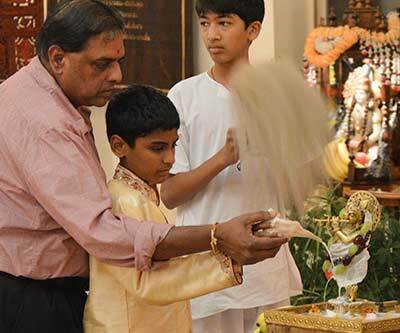 To see and hear the festivities (except when we are doing the Ratha Yatra and the breaking of the butter pot outside) one can go to this web site, and click both the buttons for temple web cam and the radio buttons for live audio. Posted in Festivals, No Side Bar, Slider.